Our personal values are deeply held beliefs of what is truly important in our lives. They are the guiding principles that form the foundation of our personal standards and guide our decisions and behaviours in our day to day lives as individuals and leaders. Each of us has his/her own personal set of core values that are usually instilled in us at a very early age. Influencers include our parents and family, friends, peers, teachers, coaches, religious leaders, education, and our own life experiences. Subconsciously or consciously, our core values impact every aspect of our lives. If you truly know what you stand for and what you value, you will be more focused and able to make decisions more quickly, and with clear direction. If you don’t know what your values are or if they are ambiguous, you will struggle in making decisions in your life. Our values are in action through our personal and work behaviours, decision making, contributions, and interpersonal interactions. Do you know what you stand for as a person and as a leader? Have you thought about what is truly important to you? …our authentic values and sense of meaning are deeper than this. Authentic values are forged in the traumas and privileges of our unique life story. In other words, what is important to you is based on the lessons from your life experiences. What are the top five values from your unique life story? What is truly important to you based on your life lessons? What gives you the greatest meaning in life or work? In your personal life with family? 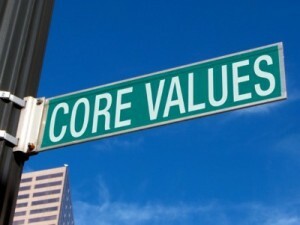 How will you make your core values a more present part of your daily life? What will you do to put your values in action every day at home and at work? Marielle’s new group coaching program, Up Your Game! will help you get clear on your values, strengths, vision, mission and much more to propel your career to the next level. Marielle Gauthier, owner and principal of Redworks Communications, is a certified Results coach and is accredited as an Associate Certified Coach (ACC) by the International Coaching Federation. To receive updates about our coaching programs, training and webinars or for more information on our coaching services contact Marielle at (306) 955-3205, marielle@redworkscoaching.com or visit www.redworkscoaching.com. She is based in Saskatoon, Saskatchewan. This entry was posted in Maximizing Your Potential, Redworks Blog (all posts) and tagged authentic values, core values, deeply held beliefs, leader, leadership, sense of meaning by mgauthier. Bookmark the permalink.